< 2018 Annual Report Image courtesy of Saildrone. Pictured above: A Saildrone autonomous surface vehicle on its way to collect observations from the Pacific. Image courtesy of Saildrone, Inc.
Our ocean is a massive conveyor belt, transporting heat from the equator toward the poles through a series of current systems. For example, warm waters that feed the Gulf Stream cause the climate in the United Kingdom to seem balmy relative to that found in Canada’s Newfoundland and Labrador province, which reside at the same latitude. Western Boundary Current (WBC) systems, such as the Gulf Stream, exhibit the largest air-sea exchanges of heat, moisture, momentum, and carbon dioxide gas (CO2) of anywhere in the global ocean, playing a central role in the Earth's climate system. These dynamic ocean jets act as blenders and barriers for ocean processes, and so naturally are prime areas for physical and chemical oceanographic research. Yet, the turbulence associated with these ocean jets is precisely what makes them difficult to observe in a comprehensive, persistent manner. 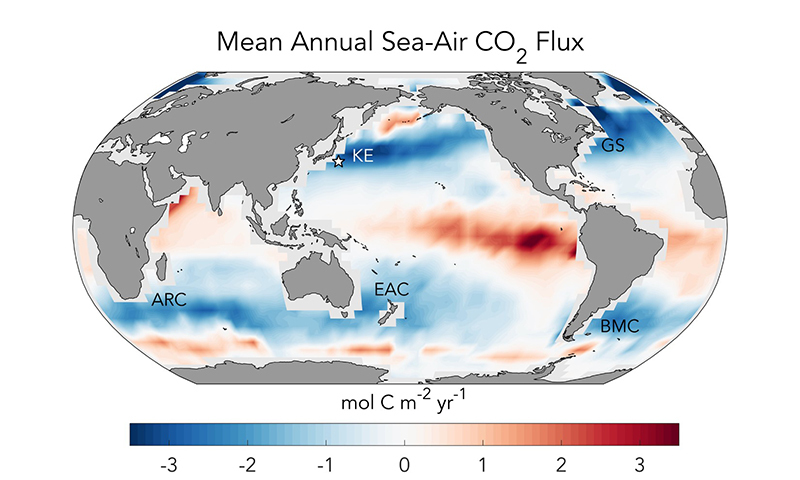 Annual mean carbon dioxide (CO2) flux between the ocean and atmosphere referenced to the year 2000, adapted from Takahashi et al., 2009. Blue areas indicate ocean sink regions for atmospheric CO2; red areas indicate ocean source regions for atmospheric CO2. The white star shows the location of NOAA’s Kuroshio Extension Observatory mooring. Western Boundary Current systems are labeled as follows: Kuroshio Extension (KE), Gulf Stream (GS), Agulhas Return Current (ARC), East Australian Current (EAC), and Brazil-Malvinas Confluence (BMC). Satellite remote sensing has unveiled fascinating patterns of oscillation in some WBC current systems through sustained, global-scale observing. However, this approach is limited to bulk physical (e.g., current speed, temperature, salinity) and biological (e.g., chlorophyll , backscatter) oceanographic parameters at the sea surface. At present, satellites are unable to assess ocean chemistry (e.g., nitrate, pH, carbon dioxide). The Kuroshio Current off the east coast of Japan is the only WBC system with near-continuous observations of ocean chemistry that span over a decade. This one-of-a-kind time-series study has resulted from the dedicated maintenance of a climate mooring—a buoy anchored to the seafloor—maintained by the National Oceanic and Atmospheric Administration (NOAA) and regional partners. However, moorings present their own challenges as they occasionally break free from anchor during large storms and need to be rescued. In addition, while the Kuroshio Current mooring has provided a wealth of novel observations, its fixed location limits our understanding in an area where eddies—think of them as the tornadoes of the ocean—can create ocean patches with unique physics, chemistry, and biology. A Saildrone autonomous surface vehicle on its way to collect observations from the Pacific. Image courtesy of Saildrone. Adding urgency to this observing challenge, the ongoing National Science Foundation-funded Southern Ocean Carbon and Climate Observing and Modeling (SOCCOM) project recently discovered that a region thought to account for 40 percent of the annual global ocean carbon dioxide uptake may in fact account for less than 10 percent. This is causing scientists to reconsider the global carbon budget and hypothesize about where the “missing” carbon is accumulating in the climate system, which is incredibly important for determining the longevity and stability of carbon storage under sustained global warming. One leading hypothesis points to the Southern Hemisphere WBC regions. In order to solve this carbon-sink mystery, a new WBC observing strategy will be required. MBARI Scientist Andrea Fassbender is collaborating with scientists from numerous institutions to tackle this problem using the Saildrone autonomous surface vehicle. This vehicle is equipped with instrumentation to measure CO2 in the air and the sea. Before diving headfirst into the tumultuous Southern Ocean, the team will first test the Saildrone in the Gulf Stream, during winter of 2019. Image of ocean conditions from the Saildrone, Inc. Mission Portal at 19:00 UTC on January 17 of 2019 based on reanalysis data. Colors reflect sea surface temperatures in degrees Celsius, thin white lines show ocean surface currents, and black lines show the exclusive economic zones for the US and Canada (left) as well as Bermuda (lower right; island not pictured). Thick, pale blue lines with triangles show the preliminary Saildrone mission waypoints. 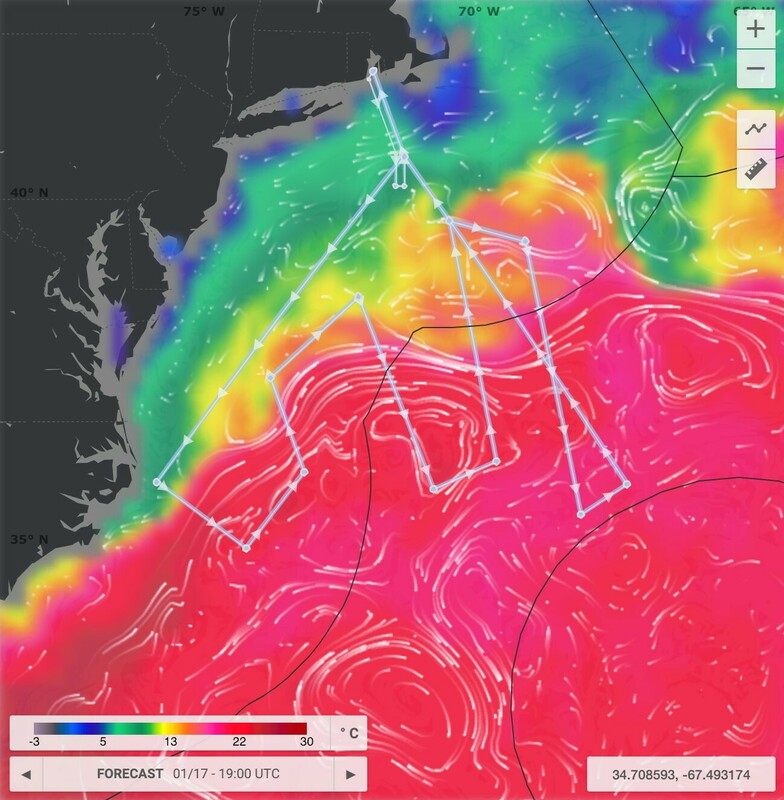 A key goal of the project is to assess the ability of the Saildrone to stay on course while crossing the Gulf Stream current under high wind speeds. 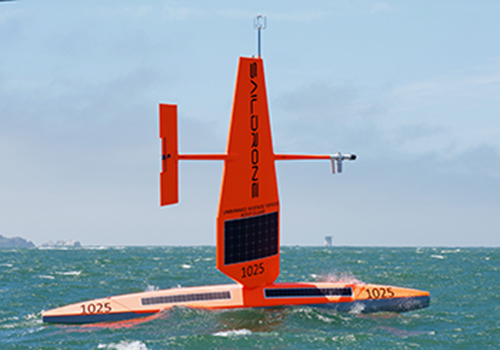 Prior trials of the Saildrone in the Bering Sea and the windless doldrums of the North Pacific suggest that it has the stamina and carbon measurement accuracy required to perform high-quality research in complicated WBC ocean domains. The University of Rhode Island research vessel Endeavor will conduct a Saildrone-following cruise during which underway observations of pH and nitrate from an MBARI chemical sensor will be made and discrete seawater samples will be collected for later carbon and nutrient analyses. The February Saildrone mission will span the peak season of ocean heat loss to the atmosphere. With very few winter observations from the Gulf Stream, this project aims to address important gaps in our understanding of the extent and variability of air-sea fluxes of heat and carbon throughout a WBC system. This will also be an important test of the Saildrone as a tool for studying WBCs, which may play an important and yet-to-be-observed role in the Southern Ocean carbon sink. Oversized jaws and stomach make this eel an effective predator in the deep sea.